Hi everyone! So it's already New Year's Eve! Time to look back on 2014. I've seen other crafters posting their favorite cards they've created during the year, and I've decided to do the same. I did this a couple of times and it's fun to see what you've done over the past year. So here goes. 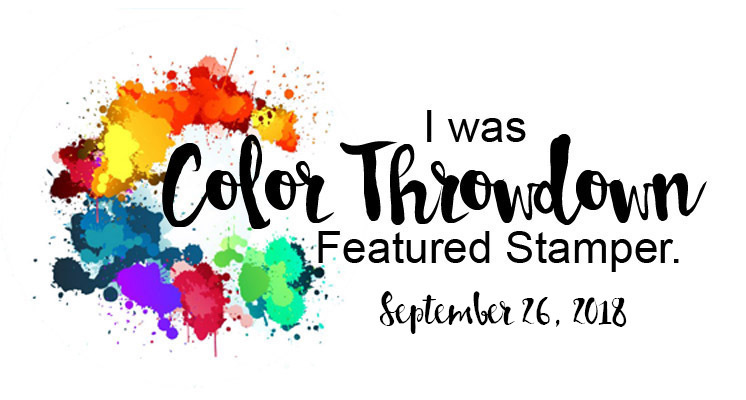 This was for a color challenge for Just Us Girls - my favorite design team ever! 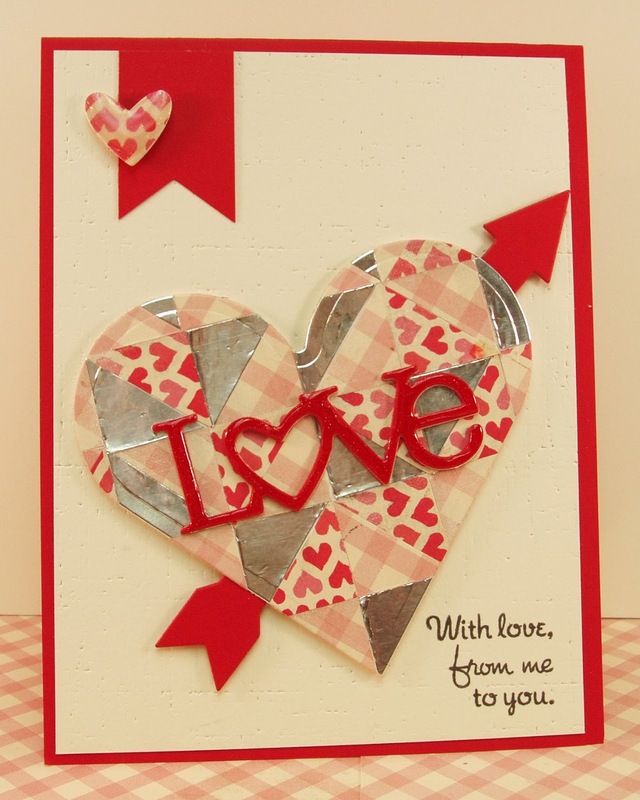 I "Love" this card, but cutting all those squares into triangles and placing them on a piece of cardstock to cut the heart was time-consuming! It went to my hubby for Valentine's Day! 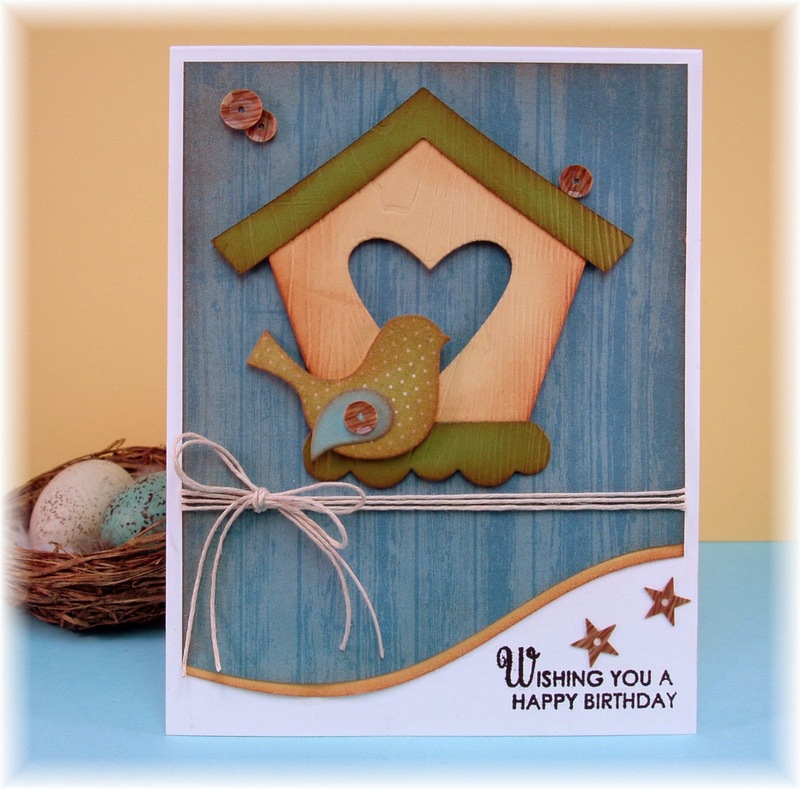 I just love birdhouses! We have a few at our home and many at our cabin. It's relaxing to watch the birds fly in and out of them! Trying my hand at what seemed to be the technique of the year - water coloring! 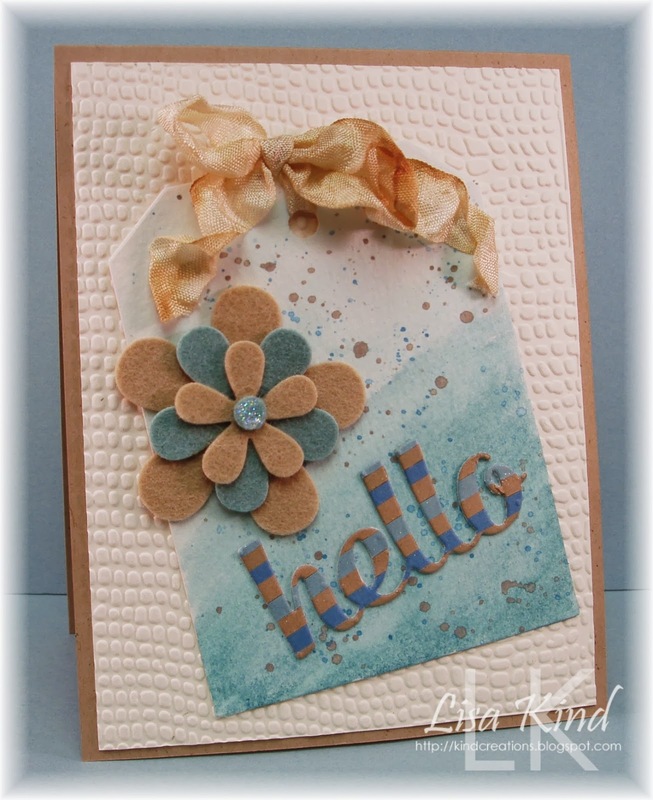 I love kraft paper, but don't use it enough! I have two for June. This one is my absolute favorite! 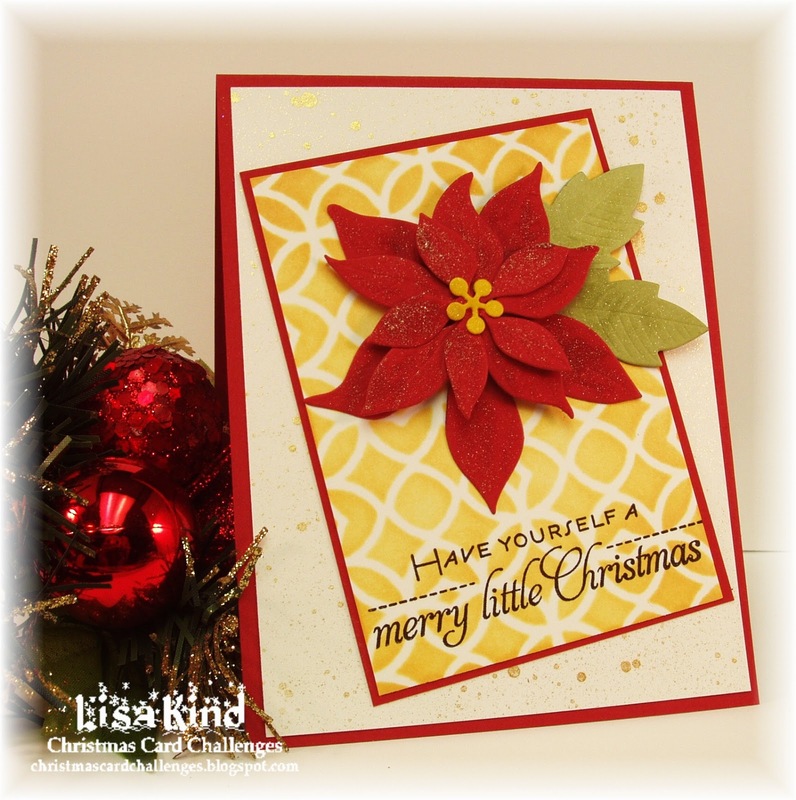 But this is the first card I made for a new design team I joined - The Christmas Card Challenge! I've always loved flamingoes and had to have this set! 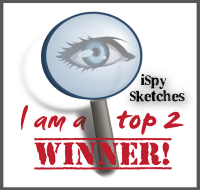 I also have two for this month. This one just makes me "Smile". And this one was made for my Polish relatives in Poland. It says Merry Christmas. 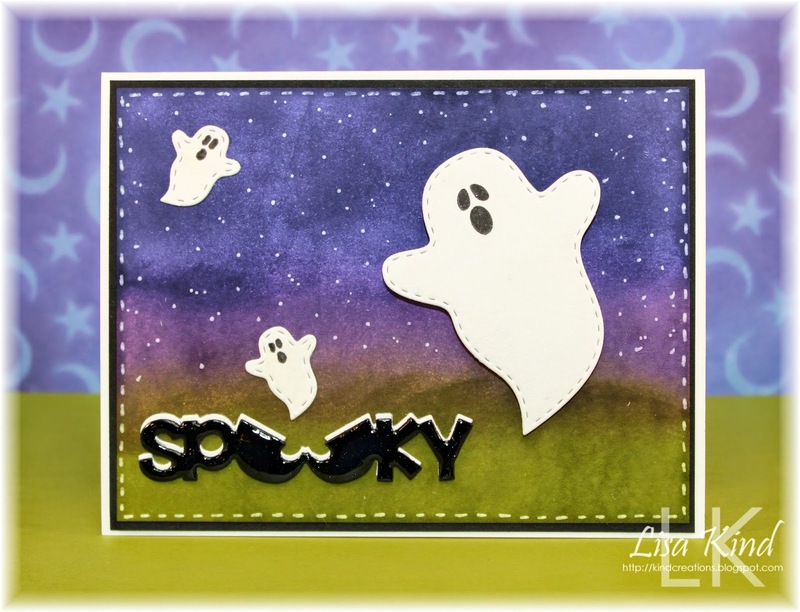 I don't make many Halloween cards, but I had fun creating the background on this one! 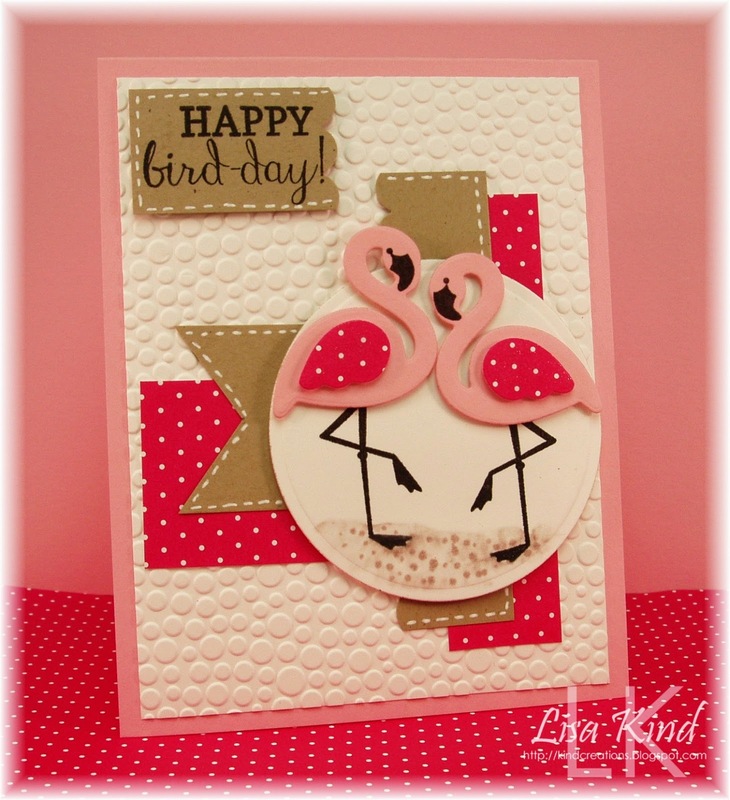 Well I had to include this card! We had a doozy of a snowstorm here in Buffalo, NY in November and I was stuck in the house for a whole week! I got my craft on during that time! I love tags! I made quite a few this year, and these happen to be my favs! And I'm going to choose this one as my favorite from the entire year! I hope you have a great New Year's Eve and an even happier 2015! Thanks so much to all of you who have commented throughout the year! I know I'm terrible at commenting, but please know that I look at what you've been creating and I totally appreciate what you do! Hi everyone! Gosh it seems like forever since I've posted. Most of the cards I've posted were done back in November when we had that really bad snow storm that kept me housebound for a full week! I've got to get back into the swing of things! 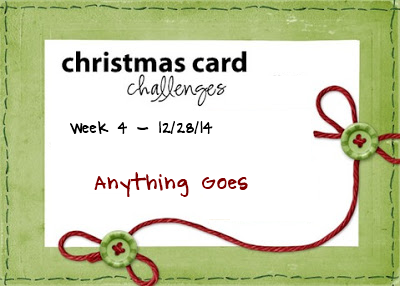 This week over at Christmas Card Challenge, it's an anything goes challenge. 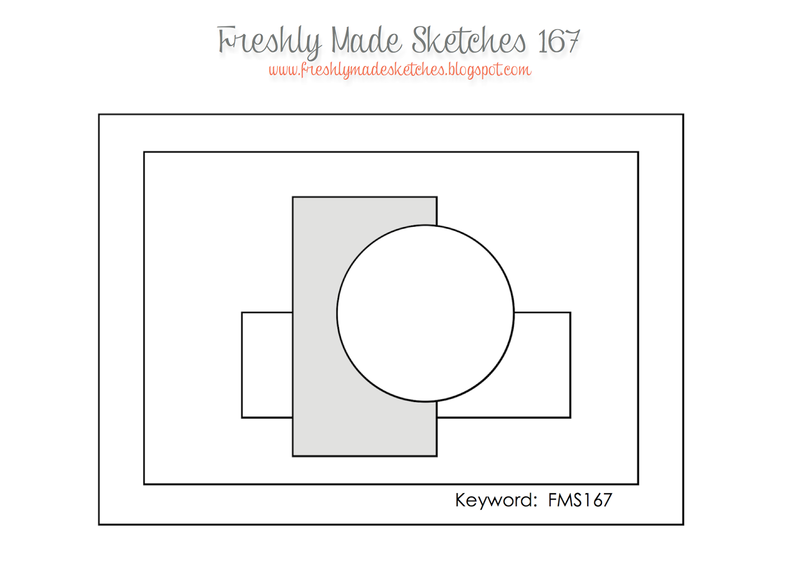 I used this Freshly Made Sketch for my layout. You can see more on these blogs. Hi everyone! How was your holiday? I hope it was fabulous! 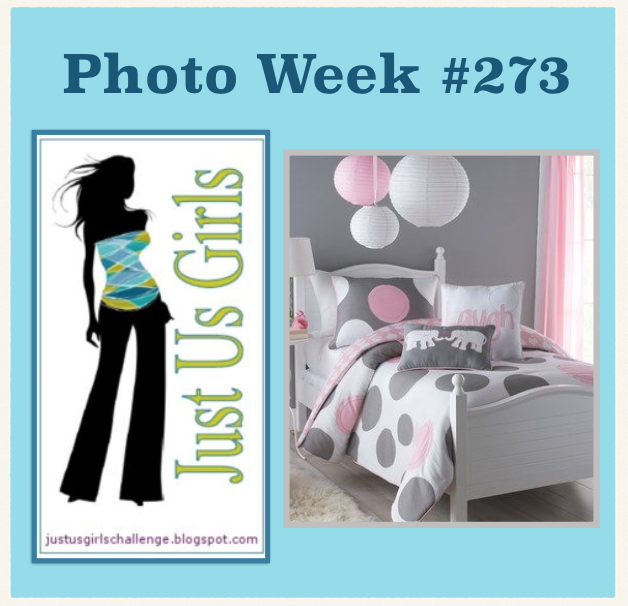 We have a great photo this week for our Photo Week challenge over at Just Us Girls chosen by Nancy. 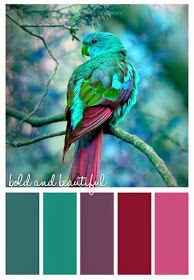 I love the colors and the graphic nature of it! You can see more from the design team on these blogs. Hi everyone! Are your days getting more and more hectic this week? I hope you have time to play in this week's Just Us Girls challenge. Ina has chosen these fabulous colors for our color week challenge. Here is a close up of the picture and colors. 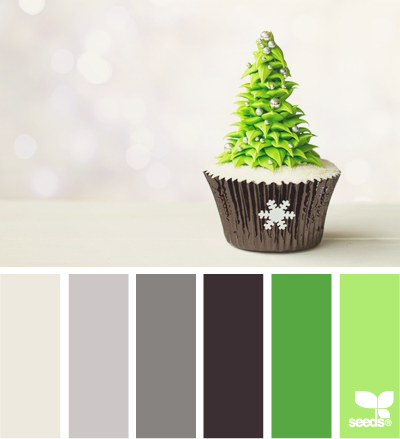 I imagine that these colors would make for a beautiful Christmas card. 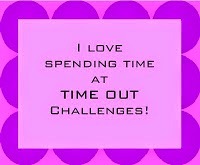 But I've done enough of those and needed a break. 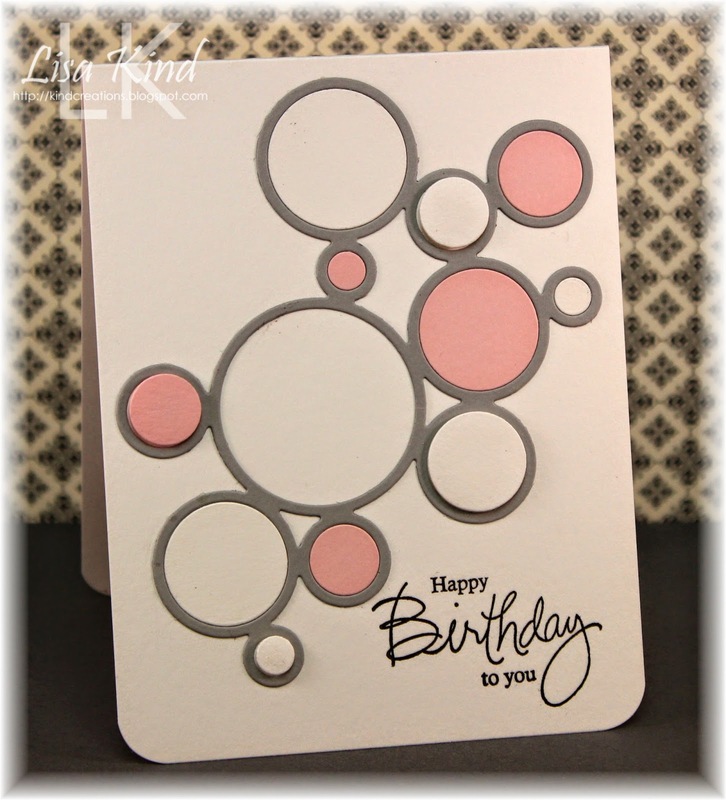 I went through my stash of stamps and came across this Modern Basics one from Papertrey Ink. 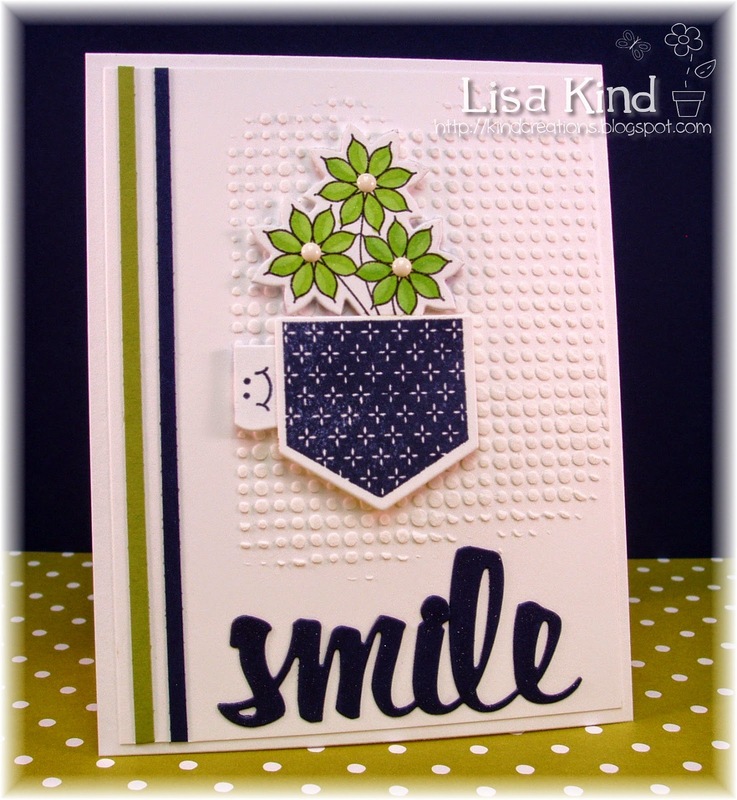 I looked at some samples on their site of how all these pieces could be used and found one I fell in love with from Betsy Veldman. 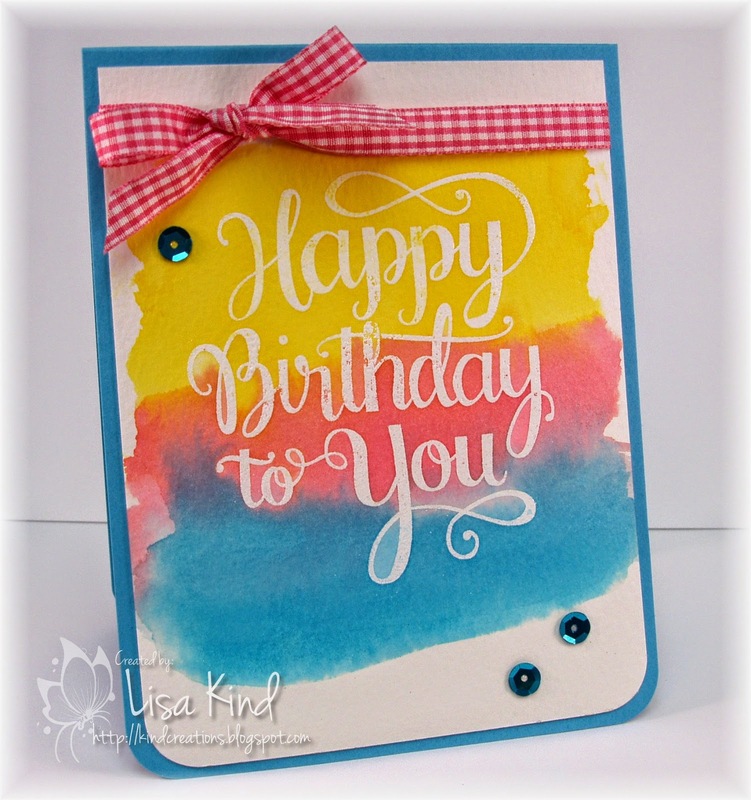 She just knows how to put fun colors together! 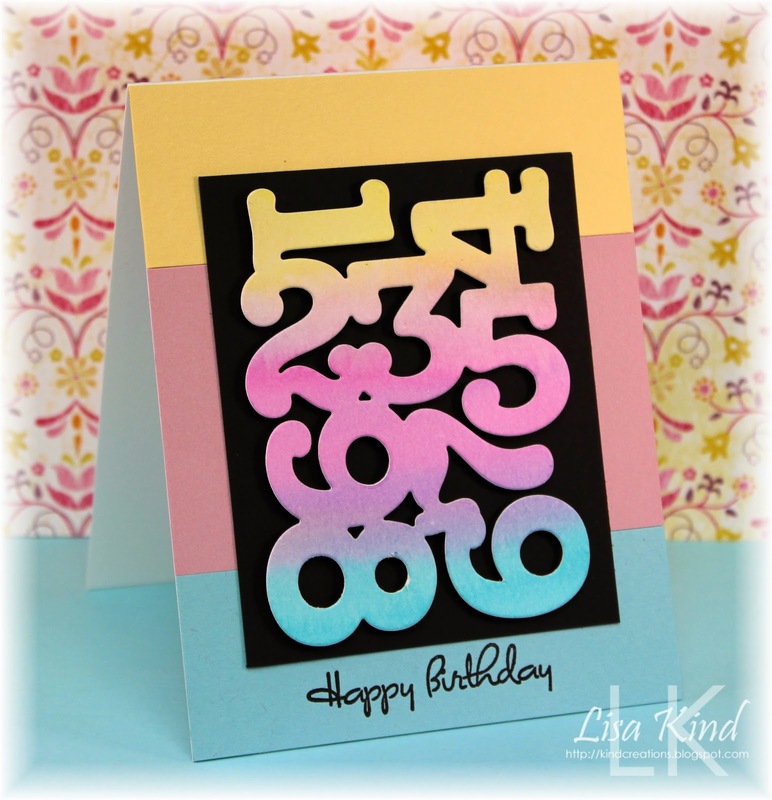 So I sort of cased her card (well, at least the stamping portion of this card), I used several of the colors from the challenge and created the background. Then I took that tide pool ink and colored some white cardstock with it so I had an exact match. I then die cut the butterfly from it. That is placed on dimensionals in the center. 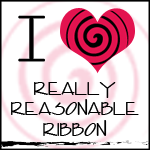 I wanted to do something different, so I die cut the bow from white cardstock and added it along the side to make it look like it was actually ribbon tied on. You can see more from design team on these blogs. Hi there! 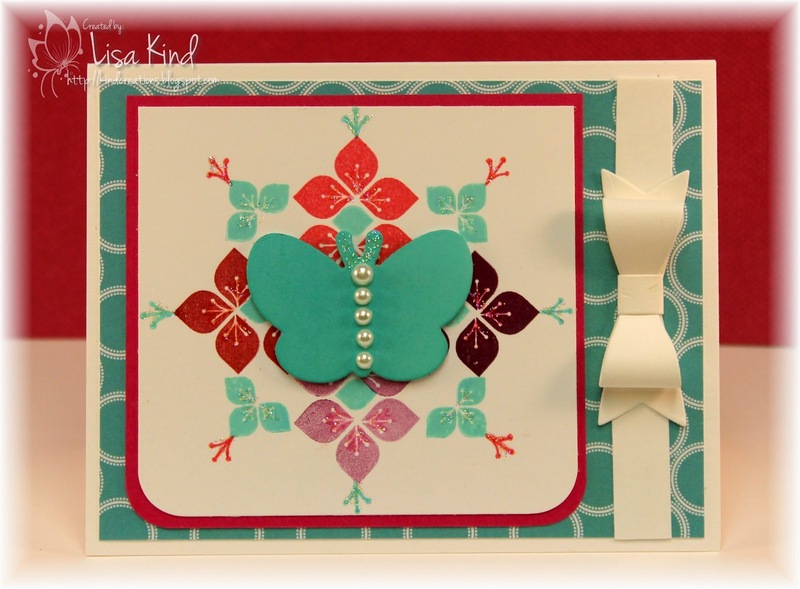 I'm here with a new challenge over at Christmas Card Challenges. 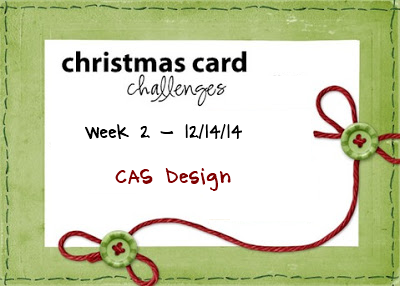 This week the challenge is to create a CAS design. This one was whipped up very quickly. 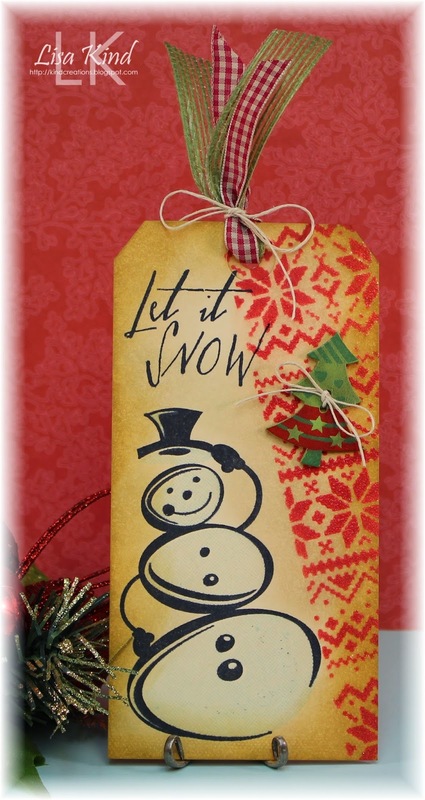 I got some new products from Simon Says Stamp the other day, and this Mosaic Ornaments stencil was calling my name for this challenge! I sponged red and green distress inks through the stencil and pulled it up. Love the reveal! Then I used a Versamark pen (I've had mine for years and never used it...I was still juicy!) 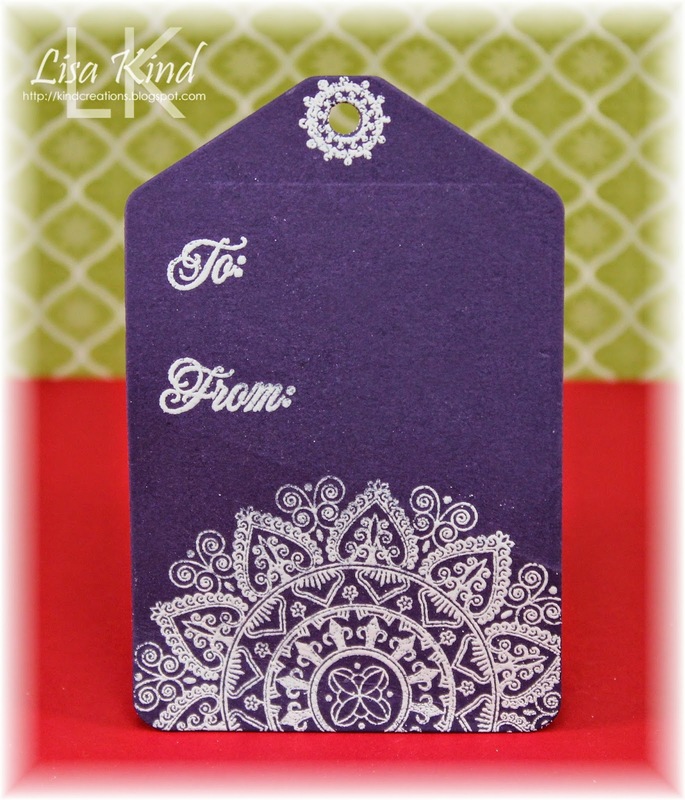 and drew a string then embossed it with embossing powder. The sentiment was stamped in Versamark and embossed also. I die cut the bow, stamped it in Versamark, and embossed it too. I added it to the ornament with dimensionals. A strip of pattern paper was adhered to the left side and the white panel was added with lots of dimensionals. Lastly, I added clear sequins. Happy Saturday! 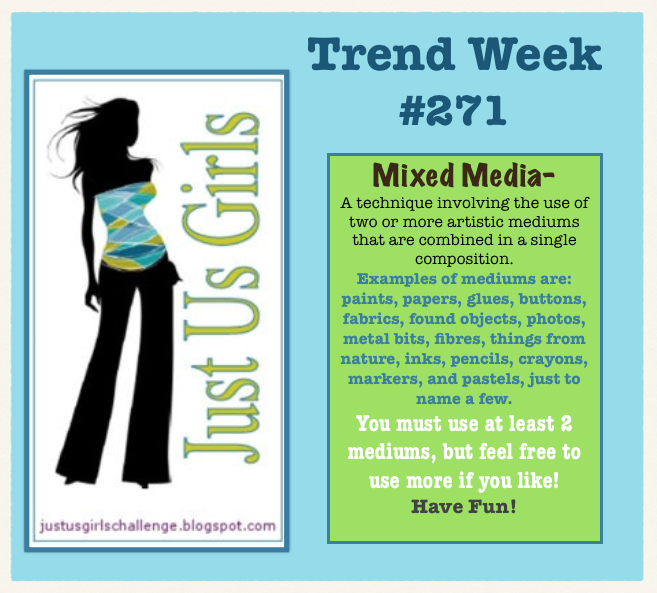 We have a new Trend Challenge over at Just Us Girls. 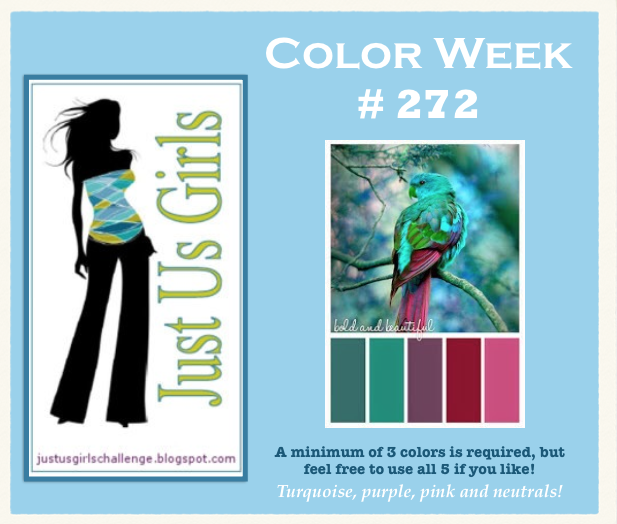 This week, Maria has chosen a mixed media challenge. Love these! I love tags! I don't know what it is about them, but I just love creating them! I started this one with a manila tag. 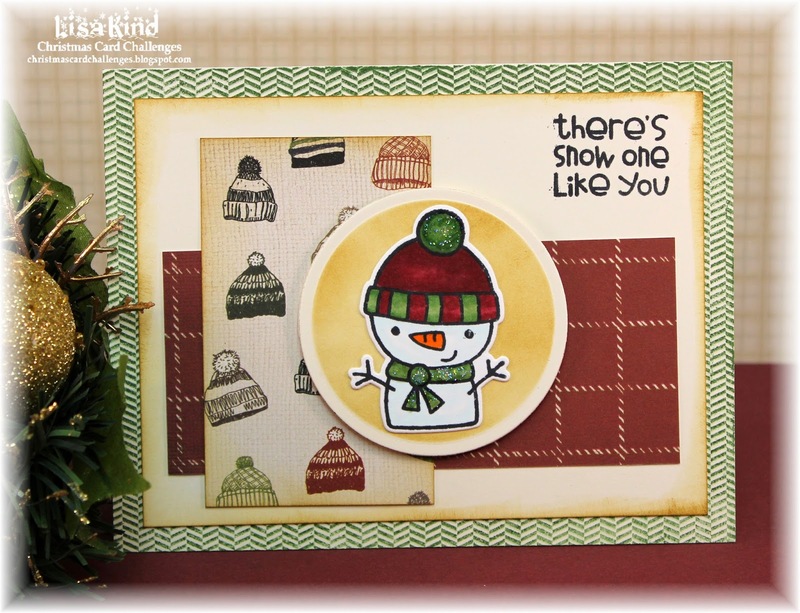 I stamped the snowman and sentiment in Archival ink and overstamped the snowman in blue ink (hard to see...it's the halftone stamp). Then I sponged red distress in on the other half of the tag. Before it dried, I covered it with clear embossing powder and heat set it. I then took more distress inks to age the tag. I found these holiday buttons in my stash, but they were too bright so I added some distress inks to it to distress it a bit too. Twine was added to the button and it was attached to the tag. I chose a ribbon and burlap ribbon for the finishing touch. You can see more inspiration from the design team on these blogs. Hi friends! 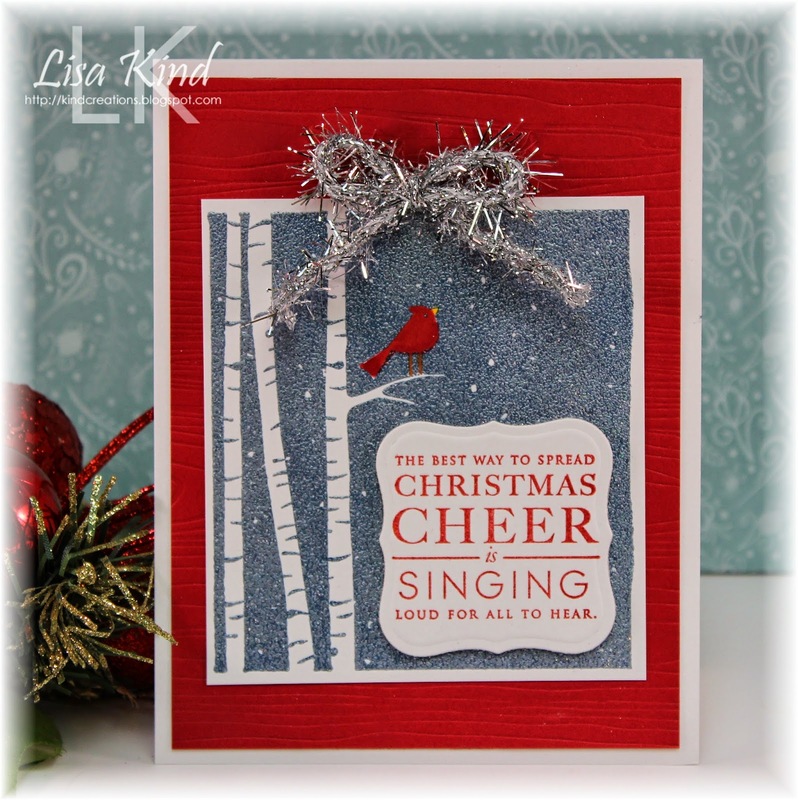 We are starting a new term over at the Christmas Card Challenge blog. Today is our first challenge. 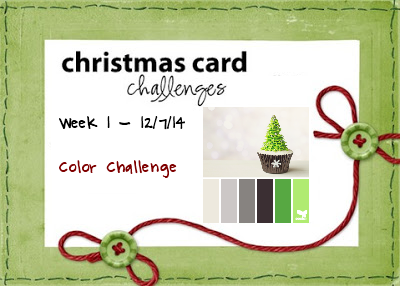 The first challenge is a color challenge. I chose to use the colors but also the photo as my inspiration. I was looking through my Christmas stamps and found this one. It's never been inked (of course!) and I thought it would work nicely for this challenge. I colored it with copic markers and added silver liquid pearls. The word was die cut five times and stacked. I added glossy accents to make it shiny. I didn't save the dots above the "i" so I just dotted it with a silver liquid pearl. I added some baker's twine and tied it with a bow. 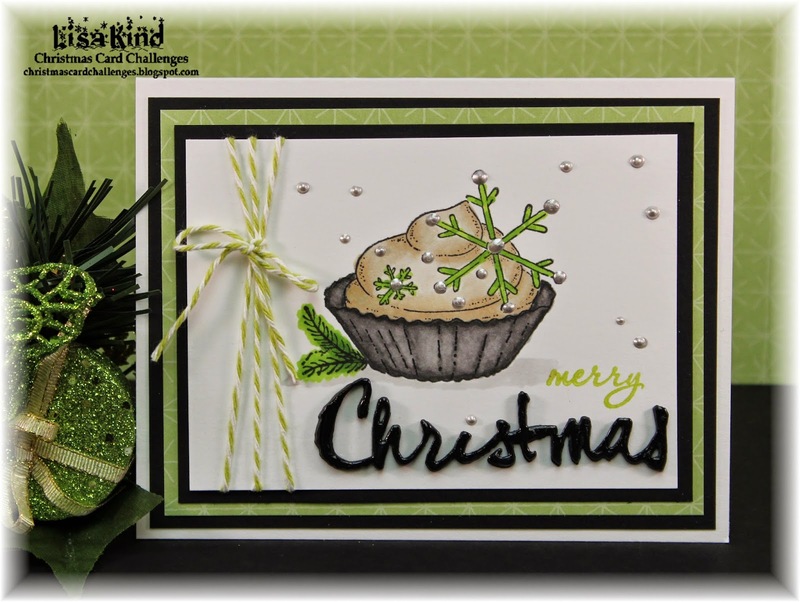 You can see more inspiration on the Christmas Card Challenge blog and these blogs. But first, here are our new members for this term . And the rest of the team. 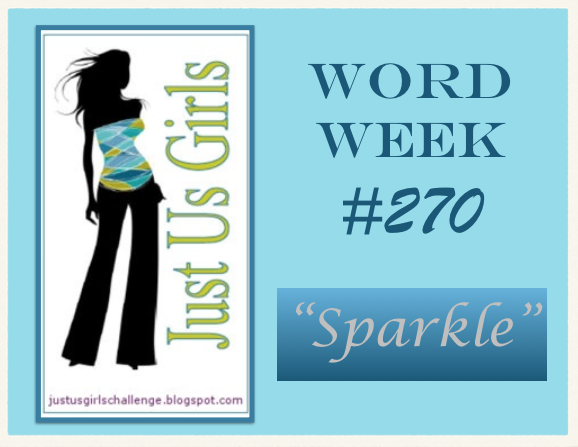 Our word week at Just Us Girls this week is **Sparkle** brought to us by Sue. I love sparkle! This card really sparkles, but it difficult to see capture it on camera. I stamped this image in blue pigment ink and embossed it with a powder called bridal embossing powder. It's clear with some glitter in it. Really sparkles! I colored the bird with copic markers. After looking for the "perfect" sentiment, I found this one. Kind of goes with the bird possibly singing on that limb. To add more sparkle, I pulled out some tinsel and created a bow. That red piece was embossed with a woodgrain impression plate. You can see more from the team and our guest designer on these blogs. Hi everyone! Today is the last day for my four days of tags! 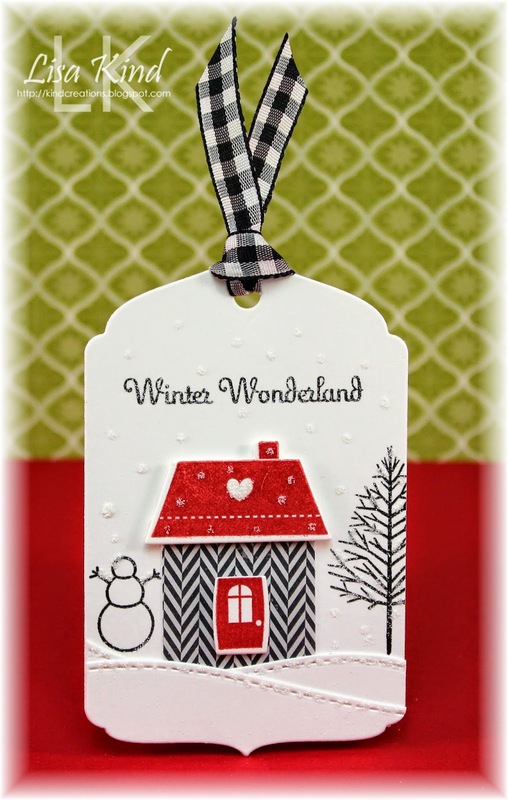 I saw a tag on Pinterest that Laura Bassen did with the Polka Dot Parade #10 House set. 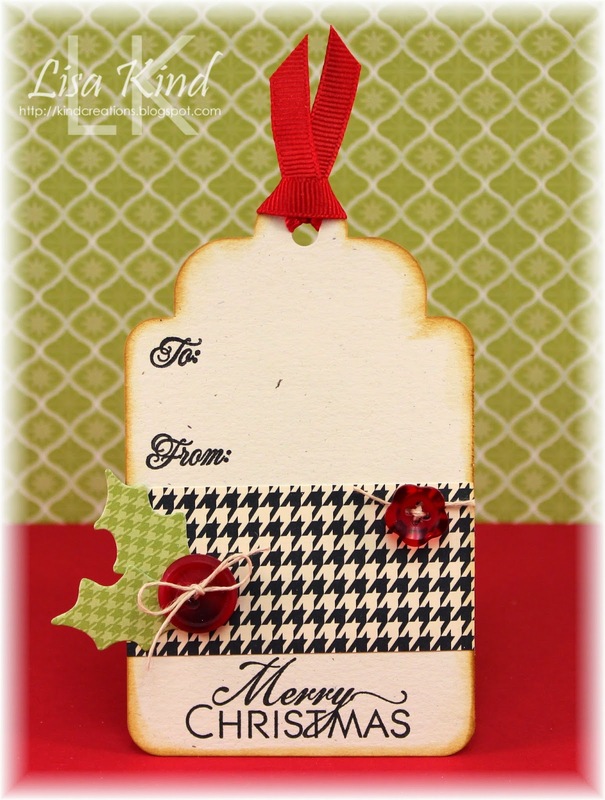 I pulled mine out and made a Christmas tag using it. This one is my favorite! I die cut the tag and then die cut just the bottom of the tag two more times. I did that so I could die cut the snow drifts. I adhered them to the bottom of the tag and then adhered the house. The door and roof were stamped, and the base of the house die cut from pattern paper. I added the little snowman and tree to make a scene. 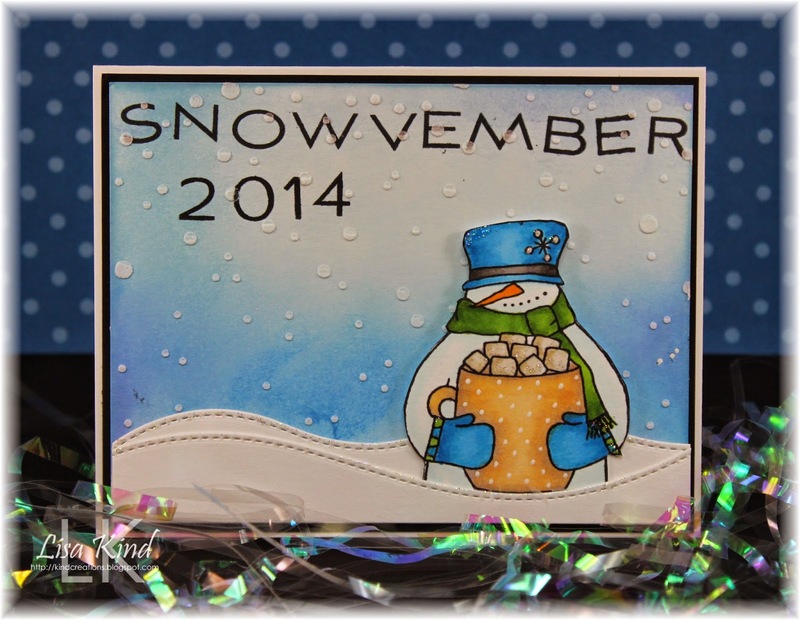 After stamping the sentiment, I made some dots with glue and added glitter to make it look like snow. I think this is just so cute! Thanks for stopping by again! I hope to see you again soon! Hi friends! 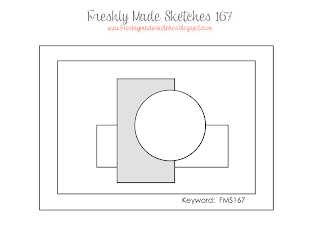 Today I have another tag that I cased from Pinterest (you can see it on my Tag Board). I just love black and red together, so this one really caught my eye. The tag is actually a tag card that I cut in half (I made another one of these with that part). I started by stamping the sentiment on the bottom and worked my way up. Then I sponged around the tag with brushed corduroy distress ink. The holly leaves were die cut from pattern paper and a button tied with twine was added on top. I added another button to finish it off. 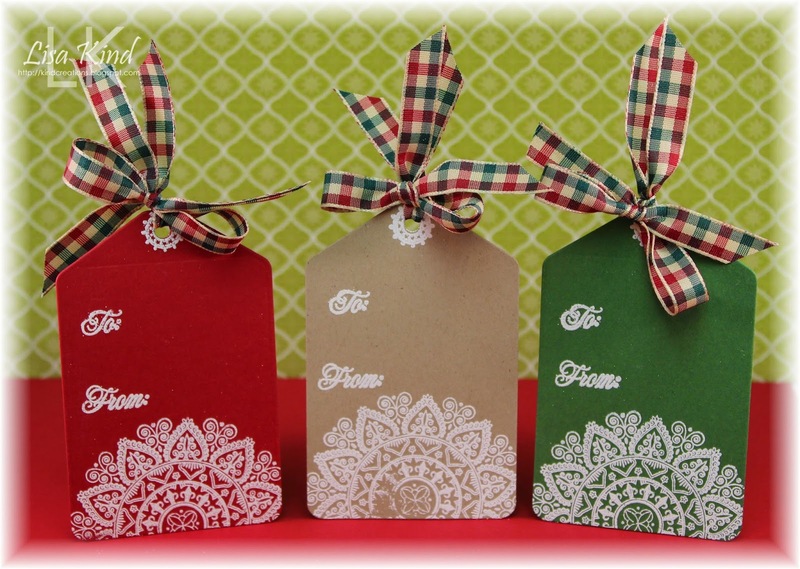 I'm having so much fun making these tags! They are just little canvases that are so adorable! I'm back with more tags. I made a bunch today! I think I got a little carried away! I started making them in Christmas colors. 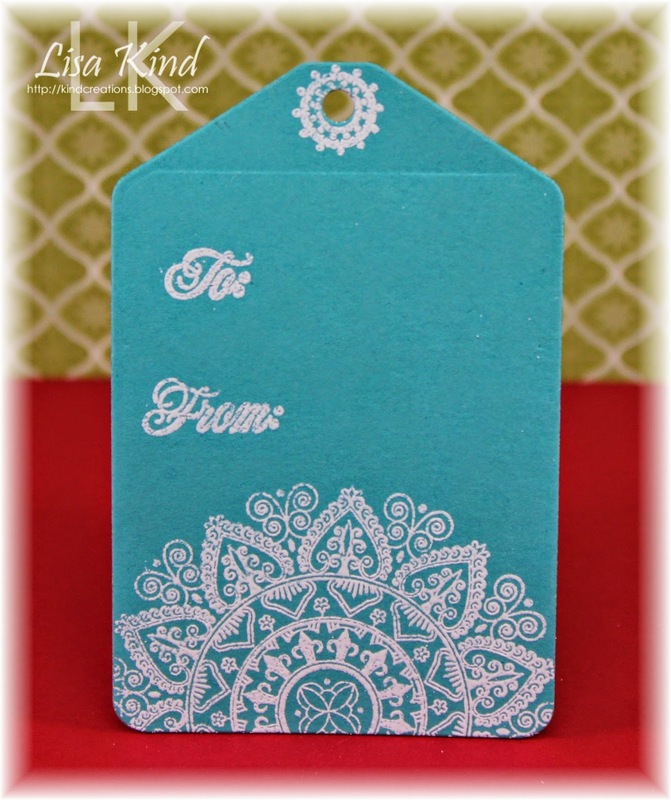 I saw one on Pinterest (I pinned it to my Tag Board) and just fell in love with the simple doily design on the bottom. I pulled out my Mendhi Medallion set and went to work. I stamped half the medallion on the bottom in Versamark along with the to/from and another medallion for the hole then embossed it with white powder. I thought they looked so elegant! That's it for today! Thanks for stopping by! 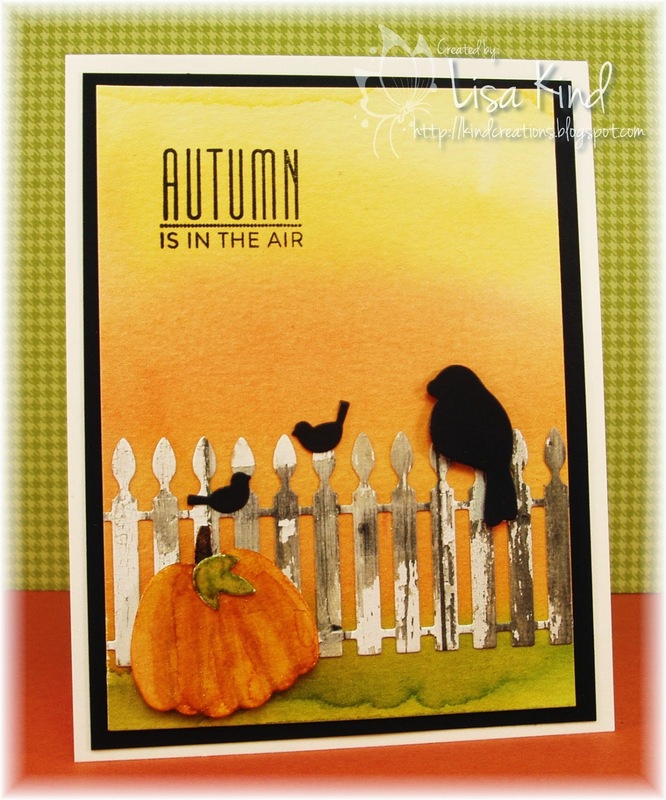 I'll be back tomorrow with another cased tag from Pinterest!